On another planet, the team celebrates Harrison’s birthday and share special birthday memories. Ec’co only has bad memories of kids parents making up excuses for their kids not to go to his parties because he is so different from them. Ec’co leaves the group and attends to the vehicles. Ec’co feels lonely because he is so different from other humans and would like to go to his mother’s home world Hrath. With the support from others, Gus comes to the decision that he and Ec’co could visit Hrath unarmed. As Gus and Ec’co step through the wormhole, the Stargate is struck by lightning and damages the Stargate. Upon their arrival, Gus and Ec’co are detained by the Hrathi and are brought to the interrogation chamber. Back on the other planet, the rest of the team recovers from the lightning blast and tries to find a way to repair the Stargate. Back on Hrath, Ec’co continues to have bad childhood memories of kids making fun of him for being a half-breed. The Hrathi question his loyalty because of this fact. They also question Gus’s loyalty, but Gus explains that he was framed. Stargate Command was informed that they had escaped. If they truly are compromised, precautions must be taken. Gus and Ec’co are placed in holding cells to be questioned later. Back on the other planet, Harrison, with the help of Draga, comes up with a way to recharge the Stargate using the lightning to charge the vehicle batteries. Back on Hrath, Ec’co regrets having come to this world noticing that there is prejudice even there. Wishing he had a place to call home, Gus attempts to comfort him by explaining that home is simply where people love you and is not so much a place on a map as a place in the heart. Hrath is suddenly attacked by a Tlak’kahn pyramid ship so Gus and Ec’co escape from their holding cell to help the Hrathi defend their world. Together, they over power the Tlak’kahn forcing them to retreat. Back on the other planet, Harrison finishes installing a rod over the Stargate that will serve to transfer the electrical energy to the batteries when the lighting strikes. Gus and Ec’co are taken to a bunker where Tlak’kahn artefacts within a recovered pyramid ship are being stored. They take a ride via transport rings to a room where the artefacts are being stored. They are presented information crystals that could help clear their name if only the information can be deciphered. The Hrathi known as Madek suddenly draws his weapon and reveals himself to be a shape shifter. Gus realises at that point that this is how they must have set him up back at Stargate Command. Madek grabs an explosive device stored near the crystals and activates it later retreating via the transport rings. 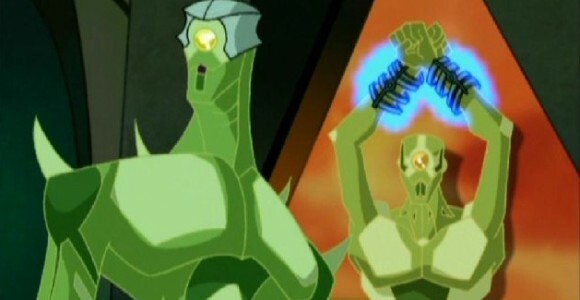 As Ec’co throws himself as a sacrifice to save the others, Commander Loto explains that all artefacts in the room are replicas to test the loyalty of outsiders. He had no idea the test would reveal a traitor amongst their ranks or an unexpected hero. He thanks Ec’co and asks his forgiveness. Ec’co graciously accepts and is offered a genuine Tlak’kahn data crystal. He and Bonner are granted safe passage through the Stargate.